2001. Plant Health Progress. This article is in the public domain. Accepted for publication 27 July 2001. Published 23 August 2001. Glenn, D. M., van der Zwet, T., Puterka, G., Gundrum, P., Brown. E. 2001. Efficacy of kaolin-based particle films to control apple diseases. Online. Plant Health Progress doi:10.1094/PHP-2001-0823-01-RS. Studies were conducted from 1997 to 1999 to evaluate the effect of processed kaolin-based particle film applications on the incidence and severity of apple (Malus domestica Borkh.) diseases. Greenhouse and field studies demonstrated that pre-emptive application of hydrophobic and hydrophilic particles reduced the incidence of fire blight (Erwinia amylovora (Burrill) Winslow et al.) in blossoms and injured shoots. Hydrophobic and hydrophilic particles suppressed sooty blotch (Gloeodes pomigena (Schwein.)) and flyspeck (Schizothyrium pomi (Mont. & Fr.) Arx: anamorph Zygophiala jamaicensis Mason) to levels equivalent to conventional fungicides. In field studies, apple scab (Venturia inaequalis (Cooke) Wint. : anamorph Spilocaea pomi Fr.) was not suppressed by hydrophilic particles. Hydrophilic particles did not interfere with the action of conventional fungicides or the activity of calcium hydroxide to suppress apple scab. Hydrophilic particles did reduce powdery mildew (Podosphaera leucotricha (Ell. & Ev.) E.S. Salmon (anamorph Oidium farinosum Cooke)) russetting on fruit, but leaf infection was extensive. As fungicides are removed from the marketplace and resistance to fungicides continues to develop in microbial populations, new approaches to control plant diseases are needed. Glenn et al. (4) proposed a new concept of disease control using hydrophobic kaolin particle films in which a hydrophobic layer of particles kept water physically separated from the plant surface and demonstrated the concept in suppressing fire blight and apple scab. Neinhuis and Barthlott (14) suggested that in native plant populations, water-repellent and self-cleaning plant surfaces evolved to remove surface contamination such as pathogens, water films that reduce CO2 diffusion, soil dust particles that increase leaf temperature, and salt deposits that are phytotoxic. Puterka et al. (16) demonstrated that Fabraea leaf spot (Fabraea maculata Atk.) of pear was suppressed by both hydrophobic and hydrophilic kaolin particles, presumably through both a physical interference in the infection process and a lack of adherence of inoculum to the plant surface. In addition, there was an increase in pear fruit yield that was thought to result from the reflective nature of the particles that reduced plant temperature (4,5). Potassium silica application was effective in controlling powdery mildew due, in part, to mechanical abrasion of the hyphae (2,13). Whitewash reduced the incidence of insect-transmitted viruses in potato (9), pepper (10), and rutabaga (8) and suppressed the transmission of citrus stubborn disease (6) and papaya decline (3). Whitewash treatments reduced insect-transmitted disease by repelling the vector and suppressing feeding, apparently due to the reflective nature of the whitewash. A combination of aluminum, silica, and titanium dioxide was effective in controlling downy and powdery mildew of grapes (12) through mechanisms that may include: (i) direct action on the hyphae; (ii) interference with recognition of the plant surface; and (iii) stimulation of the plant’s physiological defenses. Anti-transpirant films reduced the incidence of powdery mildew on wheat and barley (23,24), general cucurbit diseases (25), and powdery mildew of Zinnia (7). Anti-transpirant films form an artificial barrier on the plant surface that interfere with the infection process. The purpose of the present studies was to identify apple diseases that could be suppressed by chemically inert, processed, kaolin particles. Fireblight incidence in blossoms and shoots was measured in greenhouse and field trials in addition to field studies evaluating the effect of kaolin particles on apple scab, powdery mildew, sooty blotch, and flyspeck. Glenn et al. (4) demonstrated that fire blight could be suppressed by the application of a hydrophobic dust to the flowers of apple and pear. The development of liquid formulations of hydrophobic and hydrophilic particle film materials (16) greatly improved the practicality of particle film materials. Two fire blight experiments were conducted in a naturally illuminated greenhouse maintained at 18 to 20°C. High relative humidity (60 to 80%, measured with a hygrothermograph) was maintained by a film of water on the floor and a water vaporizer operating 24 hr/day. In experiment 1, dormant stem cuttings of ‘Rome’ apple were forced to bloom in the greenhouse and kept in 500 ml bottles of water that were exchanged weekly. In experiment 2, dormant potted trees of ‘Rome’ apple were forced to bloom in the greenhouse. In both studies, when 80% of the flowers were open, the unopened flowers were excised from the cluster and treatments applied in a completely randomized design consisting of 6 replications. Twenty to 50 flowers were treated with a single treatment within a replicate. Flowers were sprayed to drip with either 108 CFU of Erwinia amylovora (Ea) strain AFRS-581 or one of the particle treatments. After drying approximately 1 hr, the particle treatments were applied to the inoculated flowers, and the particle treated flowers were inoculated. The controls were: water only, Ea only, or particles only. Treatments were applied in an area outside the greenhouse with a hand-pump sprayer delivering a fine mist. Disease incidence was recorded 7 days after treatment and every 3 to 5 days until no further symptoms developed. Disease data are expressed as percentage of flowers treated, and the percentage data were arcsin transformed for statistical analysis. Data were analyzed using the Statistical Analysis Software (SAS Institute, Cary, NC) PROC ANOVA software. The following treatments were applied to the open flowers in experiment 1: (i) 3% (wt/wt) Surround® WP Crop Protectant (Engelhard Corp., Iselin, NJ), a hydrophilic kaolin particle with wetting and sticking agents added in dry form; (ii) 6% (wt/wt) Surround WP Crop Protectant; (iii) 3% M96-018 (Engelhard Corp., Iselin, NJ), a hydrophobic kaolin particle; and (iv) 6% (wt/wt) M96-018. The M96-018 was initially mixed with methanol (3 g M96-018/4 ml methanol) to ‘wet’ the hydrophobic particles, and the particle-methanol suspension was added to 96 ml or 48 ml water, respectively. In experiment 2 the treatments were: 3% (wt/wt) Surround WP, Copper Count N® (Copper ammonium complex 0.5 g/liter [Mineral Research Development Co., Charlotte, NC]); Blight Ban® (1 g/liter, Plant Health Technologies, Boise, ID); streptomycin (0.5 g/liter, Novartis Crop Protection Inc., Greensboro, NC); and the 2-way combinations of Surround WP with all other materials. All the particle treatments in experiment 1 reduced the incidence of fire blight whether the particles were introduced before or after inoculation (Table 1). There was no effect of the time of inoculation except for the 3% M96-018, in which application after inoculation resulted in higher incidence than before inoculation. Post-inoculation treatments with 6% M96-018 were more effective than the 3% M96-018. Table 1. The effect of hydrophobic and hydrophilic particle applications and treatment timing with and without bactericides on the incidence of fire blight in apple. In experiment 2, all particle and bactericide treatments reduced the incidence of fire blight when treatments were applied before inoculation (Table 1). Surround WP was more effective than copper, Blight Ban, or streptomycin when applied before inoculation. When Surround WP was combined with Blight Ban or streptomycin and applied before inoculation, efficacy was equivalent to the bactericides alone; however, when Surround WP was combined with copper, the efficacy was equivalent to Surround WP alone. When the treatments were applied after inoculation, all the particle treatments alone or in combinations with bactericides reduced infection compared to the inoculated control. None of the bactericides alone were effective. There was a significant synergism in which the combination of Surround WP with either Blight Ban or streptomycin applied after inoculation increased the level of disease control above the additive responses of the treatment combinations. Experiment 2, like experiment 1, demonstrated that coating the flower with inert kaolin particles, whether before or after high populations of Ea are present, reduced the incidence of fire blight infection. The interactions of bactericides with the particles were not consistent. In experiment 3, trauma blight was induced by removing leaves and exposing the leaf scar as an infection court. In 1999, 3rd leaf ‘Gala’ on Malling 9 were pruned to a central leader. In July 1999, all mature leaves were removed from the central leader and the following treatments applied: 3% (wt/wt) Surround WP, Copper Count N, streptomycin, and the combination of all 3 materials at the rates previously described. The leaf scars were sprayed to drip with either 108 CFU of Erwinia amylovora strain AFRS-581 or one of the particle/bactericide treatments. Treatments were applied with a hand-pump sprayer delivering a fine mist. After drying approximately 1 hr, the particle/bactericide treatments were applied to the inoculated leaf scars, and the inoculation was done to the particle-treated leaf scars. The controls were water only and inoculation only. After 7 days, shoot necrosis symptoms were present and were recorded every 3 to 5 days until no further symptoms developed. As soon as the typical ‘shepherds crook’ and/or orange-pigmentation symptoms were observed, the shoot was pruned. Disease data are expressed as percentage of treated shoots diseased in the total number of shoots and the percentage data were arcsin transformed for statistical analysis. The experimental design was a completely randomized block design consisting of 6 single-tree replicates. Data were analyzed using the Statistical Analysis Software (SAS Institute, Cary, NC) PROC ANOVA software. All the particle treatments and bactericides reduced blight incidence when applied before inoculation with Ea (Table 1, Fig. 1). There was no significant difference between the treatments when treatments were applied after inoculation of the leaf scar, only streptomycin was effective in reducing the incidence of shoot blight. Fig. 1. ‘Gala’ shoots treated and then inoculated with Erwinia amylovora. Untreated control (left) and treated with Surround WP Crop Protectant (right) (click image for larger view). 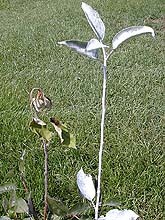 The studies with fire blight indicate that application of a particle film prior to infection will reduce the incidence of fire blight in flowers and injured shoots. In conjunction with predictive models such as Maryblyt (20) and Cougarblight (19), such pre-emptive applications can be scheduled for blossom infection periods. Particle film application to apple flowers had no negative effect on bee behavior, fruit set, fruit weight, fruit size, or the number of seeds/fruit (11). These results also confirm the field studies of Glenn et al. (4); however, there was no benefit of hydrophobic particles as compared to hydrophilic particles as demonstrated for Fabraea leaf spot for pear (16). Glenn et al. (4) proposed that a hydrophobic particle film on the surface of a plant would interfere with the infection process by either acting as a physical barrier to liquid water contacting the plant surface so the propagules are not in contact with water while on the plant surface or acting as a physical barrier to prevent the propagule from directly contacting the plant surface. They demonstrated the concept using a dust formulation of a hydrophobic material to suppress apple scab in greenhouse and potted tree studies. The development of liquid formulations of hydrophobic and hydrophilic materials (16) provided a means of testing this concept in orchard trials. In the first experiment in 1997, treatments were applied to 6th leaf ‘Empire’ on Malling 7A trees. Four treatments were imposed: (i) conventional disease and pest management based on the VA-WV pest management guide (15); (ii) untreated control; (iii) weekly applications of 3% (wt/wt) M96-018 in which 60 kg of M96-018 was added to 80 liter methanol and the suspension added to 1920 liter water; and 4) weekly applications of 1.5% (wt/wt) M96-018 in which 30 kg of M96-018 was added to 40 liter methanol and the suspension added to 1960 liter water. The two M96-018 treatments were applied with an orchard air blast sprayer delivering 2100 liter/ha or a dilute, full tree-row-volume spray. The conventional pesticide spray program was applied at 930 liter/ha. The experiment was arranged in a completely randomized block design consisting of 8 single-tree replicates. At harvest, the incidence of apple scab, sooty blotch and fly speck was assessed on 50 fruit/tree randomly selected after the tree was harvested. Data were analyzed using the Statistical Analysis Software (SAS Institute, Cary, NC) PROC ANOVA software. In the second experiment, treatments were applied to 10th leaf ‘Bisbee’ Red Delicious on Malling Merton 111. In 1997 and 1998, 4 treatments were imposed: (i) conventional disease and pest management based on the VA-WV pest management guide (15); (ii) untreated control; (iii) weekly applications of 3% M96-018, as previously described; and (iv) weekly applications of 3% Surround (a hydrophilic formulation of processed kaolin, Engelhard Corp., Iselin, NJ) with MO3TM spreader sticker, (a proprietary material of Engelhard Corp.). Surround was prepared by adding 60 kg Surround and 6 liter MO3 to 2000 liter water. The M96-018 and Surround mixtures were applied with an orchard air blast sprayer delivering 2100 liter/ha, i.e., a dilute, full tree-row-volume spray. The conventional pesticide spray program was applied in 930 liter/ha. The study was arranged in a randomized block design consisting of 4 replications each comprised of 3 trees. The center tree was sampled for disease. At harvest, the incidence of apple scab, sooty blotch, and fly speck was assessed on 50 fruit/tree randomly selected after the tree was harvested. Single-row borders prevented overspray of particle treatments and double-row borders prevented pesticide drift. A third field study evaluated fungicide-particle interactions to determine if the particle film materials interfered with the action of fungicides. Six treatments were applied to 7th leaf ‘Empire’ on Malling 7A and ‘Grimes’ Golden Delicious on Malling Merton 111 apple trees. The treatments were: (i) conventional disease and pest management based on the VA-WV pest management guide (15); (ii) conventional insect control as in (i) but with fungicide rates of 25% the recommended rate; (iii) weekly applications of 3% (wt/wt) Surround-MO3 prepared as previously described; (iv) weekly applications of 3% (wt/wt) Surround-MO3 with the full rate of fungicides; (v) weekly applications of 3% (wt/wt) Surround-MO3 with 25% of the full rate of fungicides, and (vi) untreated control. All treatments were oversprayed with the recommended insecticides according to the VA-WV pest management guide. The Surround-MO3 was prepared as previously described. The following fungicides were applied at the specified full rate and at 25% of this rate: benomyl (as Benlate® 50W) at 0.22 liter/930 liter/ha on 2 and 27 July; captan (as Captan® 50W) at 6.7 kg/930 liter/ha on 29 April, 21 May, and 18 June; dodine (as Syllit®) at 0 .45 kg/930 liter on 2 April; myclobutanil (as Nova® 40W) at 0.11 liter/930 liter/ha on 17 April; mancozeb (as Penncozeb® 80W) at 1.1 kg/930 liter/ha on 17 April; fenarimol (as Rubigan® 1E) at 0.22 liter/930 literha on 2 and 29 April, 21 May; streptomycin (as streptomycin sulfate 17W) at 0.45 kg/930 liter/ha on 17 April and 18 June; thiophanate-methyl (as Topsin®-M 70WP) at 0.22 liter/930 liter/ha on 18 June and 13 August; ziram (as Ziram® 76DF) at 1.1 kg/930 liter/ha on 2 July. The treatments were applied with a handgun sprayer applying the equivalent of 930 liters/ha. The study was arranged in a completely randomized block design consisting of 8 single tree replicates. At harvest, the incidence of apple scab and fly speck were assessed on 50 fruit/tree randomly selected after the tree was harvested. The percentage data were arcsin transformed for statistical analysis. Data were analyzed using the Statistical Analysis Software (SAS Institute, Cary, NC) PROC ANOVA software. In our earlier work (4), we demonstrated that a hydrophobic particle film was effective in preventing apple scab infection under greenhouse conditions when applied as a dust. The purpose of the present study was to determine if an effective hydrophobic particle film could be achieved using conventional aqueous spray technology in the field. The field application of the hydrophobic or hydrophilic particles did not control apple scab compared to the untreated control, and the 1.5% M96-018 treatment increased scab incidence on the fruit compared to the untreated control (Table 2). The 3% M96-018 and Surround treatments did effectively suppress flyspeck and sooty blotch, whereas the 1.5% M96-018 concentration moderately suppressed flyspeck but had no effect on sooty blotch. Coverage from the airblast application of the particle film was apparently incomplete over the surface of the fruit. Dew condensed on the fruit and leaf surfaces in the uncovered areas and because M96-018 is hydrophobic, it floated on the water surface, appearing to lift the layer of particles. The particle film appeared to retard water evaporation and so probably increased the duration of plant surface wetness which could account for enhanced apple scab incidence. Consistent lack of apple scab control was demonstrated by both the hydrophobic (M96-018) and hydrophilic (Surround-MO3) particle formulations (Table 2) and, in 1997, the hydrophilic formulation increased scab incidence. Both 3% formulations suppressed sooty blotch and flyspeck. Table 2. Effect of hydrophobic and hydrophilic particles on the incidence of apple scab and summer diseases. Values within a column followed by different letters are significantly different as determined by ANOVA and mean separation by the Ryan-Einot-Gabriel-Welsch procedure (P = 0.05). 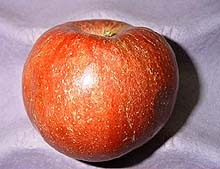 Data from these field studies suggested that the application of particle films might increase the incidence of apple scab. The effect of particles on fungicide efficacy was unknown, so a study was conducted in order to determine if the particles interfered with the activity of fungicides applied at full or quarter rate. There was no statistical difference in apple scab and flyspeck incidence when fungicide treatments were applied alone or in combination with Surround-MO3 (Table 3). When a 25% rate of fungicides was used, disease incidence increased but no effect of the particles on fungicide efficacy was measured. Table 3. Interaction of hydrophilic particles with fungicides on apple scab and flyspeck on two apple cultivars. Because particle film application may be a new tool for organic agriculture (4,5,16), we evaluated the interaction of these particles with other ‘organic’ disease control materials. In 1999, the following five treatments were applied to the ‘Bisbee’ Red Delicious block previously described: (i) conventional disease and pest management based on the VA-WV pest management guide (15); (ii) untreated control; (iii) weekly applications of 6% Surround WP in which 56 kg of material is added to 930 liter water; (iv) weekly applications of calcium hydroxide (37 kg Ca(OH)2 + 2.8 kg D-22 spreader-sticker/930 liter water (D-22 is the spreader-sticker in Surround WP)); and (v) weekly applications of calcium hydroxide and Surround WP in the rates used in treatments iii and iv. The treatments were applied with an orchard airblast sprayer delivering 930 liter/ha or 50% of tree-row-volume. In June, 100 leaves/tree were evaluated for apple scab incidence. One hundred shoots on a tree were counted and every 10th shoot was selected for disease evaluation. Ten leaves on a shoot were evaluated for visible apple scab incidence. 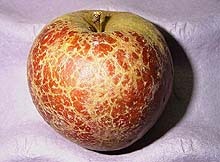 At harvest, the incidence of apple scab, sooty blotch and fly speck on fruit were measured and expressed as the percentage of fruit with surface lesions or visual fungal presence. The percentage data were arcsin transformed for statistical analysis. The study was arranged in a randomized block design consisting of 4 replications each comprised of 3 trees. Data were analyzed using the Statistical Analysis Software (SAS Institute, Cary, NC) PROC ANOVA software. In a second study, five treatments were applied to 9th leaf ‘Jonathan’ on Malling Merton 111 in 1998. The treatments were: (i) conventional disease and pest management based on the VA-WV pest management guide (15); (ii) untreated control; (iii) weekly applications of 6% M96-018; (iv) weekly applications of 6% Surround-0.25% MO3; and (v) weekly applications of 0.25% MO3. In 1999, 8 treatments were imposed: (i) conventional disease and pest management based on the VA-WV pest management guide (15); (ii) untreated control; (iii) weekly applications of calcium hydroxide (37 kg Ca(OH)2 + 2.8 kg D-22 spreader-sticker/930 liter water); (iv) weekly applications of 6% Surround WP; (v) weekly applications of monopotassium phosphate (3.1 kg KH2(PO) 4 + 2.8 kg D-22/930 liter water); (vi) weekly applications of Surround WP with calcium hydroxide at the rates of treatments (iii) and (iv) without additional D-22; (vii) weekly applications of Surround WP with monopotassium phosphate at the rates of treatments (iv) and (v) without additional D-22; and (viii) D-22 (2.8 kg/930 liter water). Treatments i, ii, and iv were applied to the same trees in both years. All treatments were applied with an orchard airblast sprayer as described above. In July 1999, 100 leaves/tree were evaluated for the powdery mildew incidence. One hundred shoots on a tree were counted and every 10th shoot was selected for disease evaluation. Ten leaves on a shoot were evaluated for visible powdery mildew incidence. At harvest, the incidence of fruit powdery mildew was assessed on 50 fruit/tree randomly selected after the tree was harvested. Percentage disease data were arcsin transformed for statistical analysis. The treatments were arranged in a randomized block design consisting of three replications each comprised of 3 trees. The center tree was sampled for disease. Treated trees were spaced within the orchard to eliminate drift of treatments. Similar to previous findings (1,21,22), we found that calcium hydroxide suppressed foliar apple scab, sooty blotch, and flyspeck (Table 4). The addition of Surround WP to calcium hydroxide had no effect on the level of disease control. Surround WP alone suppressed sooty blotch but not flyspeck or apple scab. Table 4. 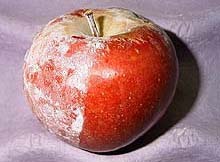 Effect of hydrophilic particles and calcium hydroxide on apple scab, flyspeck and sooty blotch of ‘Bisbee’ apple. Silicaceous materials are known to inhibit the development of powdery mildew through hyphal abrasion (2,13). Kaolin, in contrast, is a less abrasive material. We found that foliar incidence of powdery mildew were suppressed by Surround-MO3 and MO3 alone, demonstrating that the primary mechanism was the fungistatic effect of MO3, and not the particles (Table 5). The hydrophobic particle film, M96-018, reduced foliar incidence of powdery mildew but not to the level of conventional fungicides. Additives that lower the pH such as monopotassium phosphate (MKP) (17,18) or pH elevating materials such as calcium hydroxide (1,21,22), Surround WP or the D-22 spreader-sticker, did not reduce powdery mildew incidence (Table 4). Fruit russet due to powdery mildew infection, however, was reduced more by Surround WP than by D-22, the spreader sticker, indicating that the particles were interfering with infection on the fruit surface in addition to the fungicidal effect of D-22 (Fig. 2). Both MKP and calcium hydroxide reduced fruit russeting, but the combination with Surround WP did not enhance this efficacy. The level of powdery mildew control with MKP or calcium hydroxide was not statistically different from D-22. It is unclear what effect the pH modifying agents had since they were not tested without D-22. Surround WP reduced powdery mildew russet on the fruit; however, there was no effect on foliar incidence, which was so severe that tree vigor, yield, and fruit size would likely be reduced. Table 5. Effect of hydrophobic and hydrophilic particles and pH modifying minerals on the incidence of powdery mildew on ‘Jonathan’ apple trees. Fig. 2. Powdery mildew russet on ‘Jonathan’ apple: (A) Untreated control; (B) Surround WP Crop Protectant with Surround WP removed on right half; and (C) conventional fungicide program (click each photo for a larger view). In conclusion, we found that the application of either hydrophobic or hydrophilic particles were effective in suppressing diseases of apple. The particles demonstrated no negative interactions with bactericides, fungicides, or pH modifying agents and positive synergisms with streptomycin and Blight Ban in the control of fire blight were observed. We did not specifically investigate the infection process of these pathogens, but suggest that one or several of the following mechanisms are involved: (i) physical separation of propagules from the plant surface, thus interfering with chemotaxic responses required for infection; (ii) physical abrasion of the hyphae leading to ineffective infection; (iii) physical dilution of nutrients at the plant surface that reduces the vigor and growth rate of the pathogen; and (iv) removal of propagules from the plant surface through erosion of the particle film. Particle film materials appear to be a multifunctional tool providing not only disease suppression but insect repellency (16) and beneficial horticultural effects through a reduction in heat stress (4,5,16). 1. Beresford, R. M., Wearing, C. H., Walker, J. T. S., Spinks, M., Marshall, R. R., and White, V. 1995. Copper and slaked lime for the control of black spot and powdery mildew in apples. Pages 83-88 in: Proc. 48th New Zealand Plant Protect. Conf. The New Zealand Plant Protection Society, Inc.
2. Bowen, P., Menzies, J., Ehret, D., Samuels, L., and Glass, A. D. M. 1992. Soluble silicon sprays inhibit powdery mildew development in grape leaves. J. Amer. Soc. Hort. Sci. 117:906-912. 3. Franck, A., and Bar-Joseph, M. 1992. Use of netting and whitewash spray to protect papaya plants against Nivun Haamir (NH)-dieback disease. Crop Prot. 11:525-528. 4. Glenn, D. M., Puterka, G. J., van der Zwet, T., Byers, R. E., and Feldhake, C. 1999. Hydrophobic particle films: A new paradigm for suppression of arthropod pests and plant diseases. J Econ. Entomol. 92:759-771. 5. Glenn, D. M., Puterka, G. J., Drake, S. R., Unruh, T. R., Knight, A. L., Baherle, P., Prado, E., and Baugher, T. 2001. Particle film application influences apple leaf physiology, fruit yield, and fruit quality. J. Amer. Soc. Hort. Sci. 126:175-181. 6. Gumpf, D. J., Oldfield, G. N., and Yokomi, R. K. 1981. Progress in the control of citrus stubborn disease. Proc. Int. Soc. Citriculture 1:457-458. 7. Kamp, M. 1985. Control of Erysiphe cichoracearum on Zinnia elegans, with a Polymer-based antitranspirant. HortSci. 20:879-881. 8. Lowery, D. T., Sears, M. K., and Harmer, C. S. 1990. Control of turnip mosaic virus of rutabaga with applications of oil, whitewash, and insecticides. J. Econ. Entomol. 83:2352-2356. 9. Marco, S. 1986. Incidence of aphid-transmitted virus infections reduced by whitewash sprays on plants. Phytopath. 76:1344-1348. 10. Marco, S. 1993. Incidence of non-persistently transmitted viruses in pepper sprayed with whitewash, oil, and insecticide, alone or combined. Plant Dis. 77:1119-1122. 11. Mayer, D. F., and Lunden, J. D. 1999. Honey bee foraging in apple orchards treated with kaolin particle film. Annual Report-Integrated Pest and Pollinator Management. Washington State University IAREC. 1999:15-24. 12. Mendgen, K., Schiewe, A., and Falconi, C. 1992. Biological control of plant diseases. In: Biological Crop Protection Symposium, 24 May 1991. Pflanzenschutz-Nachrichten Bayer 45/1992,1. 13. Menzies, J., Bowen, P., Ehret, D., and Glass, A. D. M. 1992. Foliar applications of potassium silicate reduce severity of powdery mildew on cucumber, muskmelon, and zucchini squash. J. Amer. Soc. Hort. Sci. 117:902-905. 14. Neinhuis, C., and Barthlott, W. 1997. Characterization and distribution of water-repellent, self-cleaning plant surfaces. Ann. Bot. 79:667-677. 15. Pfeiffer, D. G., Fell, R. D., Hogmire, H. W., Dively, G. P., Barden, J. A., Byers, R. E., Marini, R. P., Walsh, C. S., Heflebower, R. F., Rouse, R. J., Yoder, K. S., Biggs, A. R., Kotcon, J. B., Steiner, P. W., Derr, J. F., Foy, C. L., Weaver, M. J., and Baniecki, J. F. 1997. Virginia, West Virginia and Maryland Cooperative Extension 1997 Spray Bulletin for Commercial Tree Fruit Growers. Virginia Polytechnic Institute and State University, Blacksburg. 16. Puterka, G. J., Glenn, D. M., Sekutowski, D. G., Unruh, T. R., and Jones, S. K. 2000. Progress toward liquid formulations of particle films for insect and disease control in pear. Environ. Entomol. 29:329-339. 17. Reuveni, R. G. Dor, and Reuveni, M. 1998a. Local and systemic control of powdery mildew (Leveillula taurica) on pepper plants by foliar spray of mono-potassium phosphate. Crop Prot. 17:703-709. 18. Reuveni, M., Oppehneim, D., and Reuveni, R. 1998b. Integrated control of powdery mildew on apple trees by foliar sprays of mono-potassium phosphate fertilizer and sterol inhibiting fungicides. Crop Prot. 17:563-568. 19. Smith, T. J. 1996. A predictive model for forecasting fire blight of pear and apple in Washington State. Acta Hort. 338:153-160. 20. Steiner, P. W. 1989. Predicting apple blossom infections by Erwinia amylovara using the Maryblyt model. Acta Hort. 273:139-148. 21. Washington, W. S., Villalta, O., and Appleby, M. 1998. Control of pear scab with hydrated lime alone or in schedules with other fungicide sprays. Crop Prot. 17:569-580. 22. Wong, J. A. L., O’Loughlin, J., Schupp, J. K., and Williams, W. 1993. High pH on leaf and fruit surfaces as a control strategy for apple scab. Page 58 in: Proc. 9th Biennial Conf. Australasian Plant Path. Soc., 4-8 July 1993. Hobart Australia, Abstract 122. Conference Design Pty Ltd. Hobart, Tasmania. 23. Ziv, O. 1983. Control of septoria leaf blotch of wheat and powdery mildew of barley with antitranspirant epidermal coating materials. Phytoparasitica 11:33-38. 24. Ziv, O., and Frederiksen, R. A. 1987. The effect of film-forming anti-transpirants on leaf rust and powdery mildew incidence on wheat. Plant Path. 36:242-245. 25. Ziv, O., and Zitter, T. A. 1992. Effects of bicarbonates and film-forming polymers on cucurbit foliar diseases. Plant Dis. 76:513-517.